Judge us not by our seemings for we are never what we appear. lest the winter come and the Dreaming pass into memory. Recall your heritage! Let the games begin! 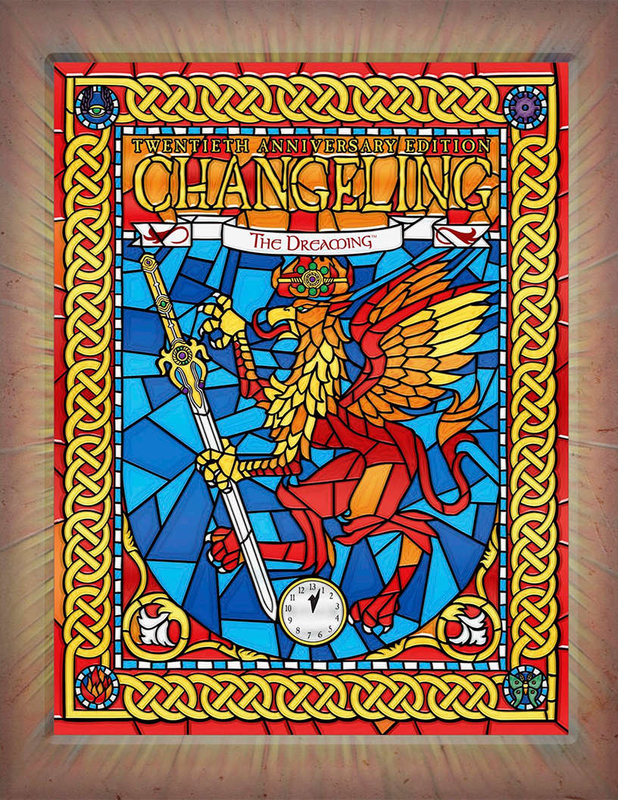 This 20th Anniversary Edition of Changeling: the Dreaming returns to that deceptively bright yet terrifying world and both compiles and completes the concepts of the previous two editions. Led by veteran White Wolf and Onyx Path developer "Blackhat" Matt McFarland, our writing team consists of longtime Changeling creators like Ian Lemke, Jackie Cassada, Nicky Rea, and Peter Woodworth, as well as familiar names such as Holden Shearer, John Snead, Maggie Carrol, Matthew Dawkins, and Krister Michl. One and all are dedicated to making Changeling: the Dreaming Twentieth Anniversary Edition the most playable edition yet - while not losing the wonder, awe, and majesty that Changeling is known for. A revised and up to date look at the World of Darkness through the eyes of the Kithain - what has happened to the Dreaming in the last 20 years, and what is the state of Glamour and dreams? Rules for all of the kiths including in 2nd ed, plus fan favorites from other books: selkies, piskies, clurichaun, and both Arcadian and Concordian sidhe. Rules for the Gallain: The inanimae, the hsien, the Nunnehi, and others! An overhauled and reimagined system for fae magic, including new Arts and the powerful but dangerous practice of Unleashing! New full-color beautiful artwork as well as classic Changeling illustrations including remastered full page pieces of the kiths by Tony Diterlizzi. £80 for a roleplaying book? Never. What's the difference between the Standard and the Premium Heavy Weight? I did a quick google search and this is what I found. I own the original 2nd edition from 20 years ago. Is there a substantive difference between the anniversary and original version? I listened to an interview with the main writer. I'm not familiar with 2nd edition myself, but it sounded like he was talking about how they added unleashing and nightmare dice. I've also seen some people talking about some thermatic things in changling which may have changed (I'm yet to read anywhere that kithian are undone at 30). It also advances the metaplot (King David comes back). Unleashing is where you tell the dreaming to do something for you, and lose complete control over an art. Very powerful but chaotic. Nightmare dice is a mechanic for adding chaos to glamour, and slowly bringing the PC closer to bedlam. Yes. Alot of the rules that were added in the CtD splat books are in the anniversary edition. All the different types of kith that weren't in the main book, the inanimae, dark kin, etc, etc. They also added fixed up the Glamour section, added the rest of the Arts, expanded cantrips. A huge improvement over 2nd edition. This pdf is filled with mistakes and omittances. A lot of the art does not describe what's in the text and many concepts are not fully explained. A big, hot technicolor mess. Why are your pod books so expensive? It seems like it's really steep. my experience with POD on here (as a publisher) is that the printing price, especially for color and heavyweight, is rather high without even adding a margin. then the publisher also wants to earn something, so you end up with products that are easily super expensive. on my own product, where I don't particularly care about the money, I have decided to slash my own earnings in favor of having affordable prices. it's still steep, especially when you add delivery. One of the things that drove me and my friends crazy about the original Changeling. Do they address the difference between the real world, and the changeling world, is the latter like the umbra, etc? I haven't read this part of the book yet but Chapter 7 "The Dreaming" has 26 pages devoted to explaining this in some detail. I remember how it worked in 2e though. If your comparison is the Umbra then it's a bit similar in that there are separate realms that work differently from our reality. But there are also chimerical things in the normal world you might see just walking down a city street. Mortals don't notice that at all. It's a bit like being in a faerie tale augmented reality* game you can't turn off. 2nd edition, and especially the 20th anniversary edition fixes and explains everything that was in 1st edition ^_^ Including how Changelings interact with mages, vampires, etc. Can someone please fix the download preview? Too bad. The message they're sending is 'we don't care'. I never played The Changeling when it first came out, so I was curious. I can see this is a best seller. I really recommend that your description actually describes what this is (I went to wikipedia for an outline), not just it's publication, author lists and revision history. Is it even a complete RPG? Why is it not available in b/w POD, more affordable formats? I think the description above is fairly detailed and clear. It's a full, complete game about playing children in a world of darkness, at least in a figurative sense. I'm not sure why a black and white version is necessary when it's essentially billed as a deluxe, full colour product. There is a quick-play if you want a less expensive taster. Actually your summary is clearer than the above. I think I might pick up the pdf. Thanks. This title was added to our catalog on September 13, 2017.